As we all know a woodchuck and a groundhog are one and the same. On a 5 degree Saturday morning, February 2nd, Groundhog Day, Woodchuck Willie was put to his task at WOODY’S. 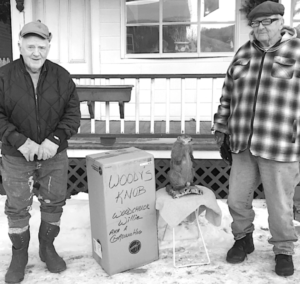 While the counter was full at 7 am with the regular coffee gang watching for Punxsutawney Phil to be brought forth from his temporary home on Gobbler’s Knob at 7:25 am, Kim and Loretta prepared Woodchuck Willie for his debut. Sam Balcom said, “Sunrise was at 7:10 am.” They compromised for 7:17 am. 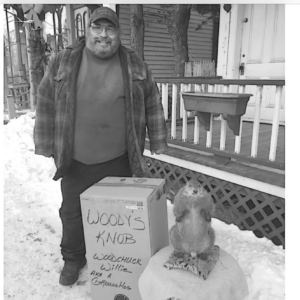 They unveiled Willie on his Knob outside (a small table and a large cardboard box) and just as they do in Punxsutawney—held him up for all to see. With daylight savings time approaching on March 10th, we can only hope Spring weather will follow on March 20th, the first day of Spring.